With so many places on the web to find fonts, it can be hard to find the best sites. In addition to Google Web Fonts, the following lists point you to some of my favorite places to look for fonts, free or for-fee. Personal use refers to usage that isn’t meant to make a profit, such as using a font on a personal blog (that doesn’t generate income) or using a font to create an invitation for your child’s birthday party. Commercial use refers to usage where a company or individual may profit either directly or indirectly from the font’s usage. For example, a person who designs blogs for a living directly profits from a font that they use within a blog design they sell to a client. Each font website varies in how it categorizes fonts for use. Always read the font license before you download or purchase a font. dafont.com: dafont is definitely one of the most popular free sites for fonts. At the top of the dafont home page, you can find many categories and subcategories of fonts to choose from — more than 18,000 fonts available for download as of this writing. FontSpace: Browse examples of the most popular fonts, new fonts, and new designers. Fonts are clearly marked for personal or commercial use, or both. 1001 Fonts: This website offers more than 3,500 fonts in a variety of categories. Font Squirrel: All Font Squirrel fonts are free for commercial use, and Font Squirrel offers some of the best quality free fonts available. The site is clean and easy to navigate. Originality: Many bloggers never pay for a font. So, purchasing a modestly priced font means that fewer designers will likely have it, and fewer readers will likely have seen it. That raises your professional and cool factors. Full character set: Free fonts come with all letters of the alphabet and all numbers, but don’t always have additional characters you might need (such as accented letters) or punctuation (such as quotation marks). 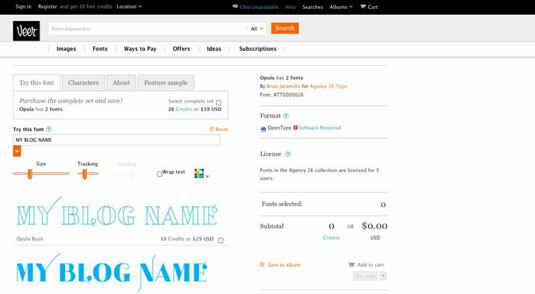 Check the character set in the font’s profile before downloading or purchasing. Well-kerned characters: Without proper kerning (spacing between characters), some letters might look too far from another, like a capital W beside a capital A, or run together, such as “rn” looking like an m. Fonts that you purchase often have better kerning than a free font. Typekit: Using one font can be free. Typekit, by Adobe, is a popular way to use great-looking web-safe fonts in your blog design. Fontspring: Fontspring makes it easy to find high-quality fonts, some of which are free. This site is a great resource if you’re looking for fonts to use in both graphic text and content text on your blog. MyFonts: This site offers more than 100,000 fonts to choose from (not that you’d look at that many). MyFonts is also the home of the fun and helpful WhatTheFont, where you can upload an image or enter a URL, and the site tries to find the closest match in its database. Fonts.com: Fonts.com has more than 150,000 fonts, which covers just about everything you can think of. 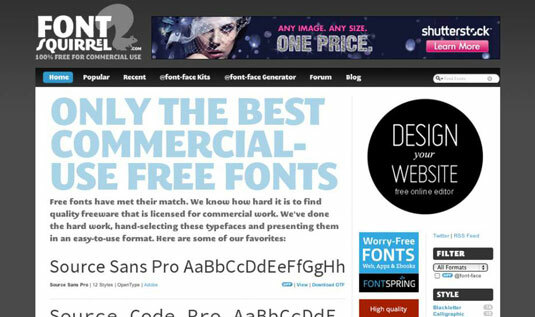 The site highlights best-selling fonts and also offers a list of the top 100 fonts. Fonts.com also has a font-identifying tool that walks you through a series of questions when you need to find the name of a font. Veer: Veer offers a wide variety of fonts (and images too). Just be aware that the licenses for these fonts covers only graphical text, not content text. At many of these sites, you can test how a font looks with your own words. Here’s how a blog name looks in a particular font with a particular color. Of course, you can also find many high-quality, professionally designed fonts at the free sites. Some fonts can give you sticker shock because sites often show font packages, which include entire font families. A font family comprises various styles and weights, such as italics, condensed, bold, and semi-bold. If there’s a font within a font family that you really like, you can often purchase a specific font versus the entire family to keep the cost lower.